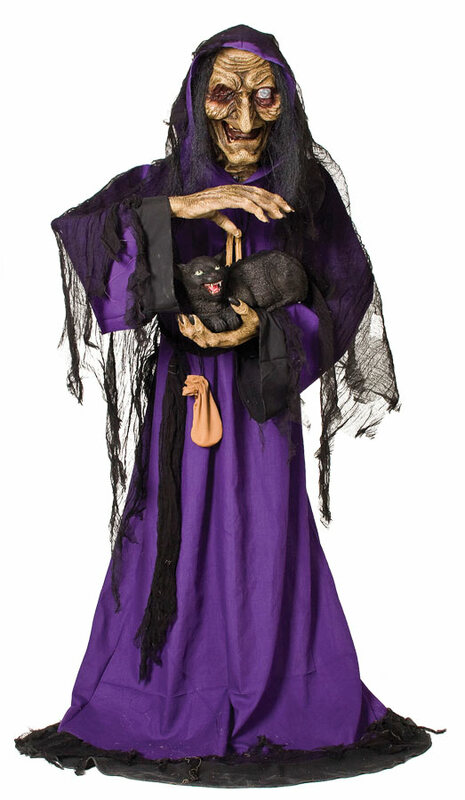 Beware the crone bearing a black cat! Standing 5ft 6in tall (66in), Matilda's head and hands are hand-painted roto-PVC, and her stooped frame is draped in a full-length hooded cotton-fabric dress with tattered-fabric details at cuff and hem and a matching hooded shawl. While petting her feral black cat with glowing red eyes, Matilda's one good eye will also glow red from within as she cackles maniacally, plotting your fate for crossing her path. Plug into any standard outlet to operate the LED eyes, the motion sensor and the 3 rotating sounds, and for her hand to pet back-and-forth over her cat. Requires 2 AA batteries (not included) to operate the LED eyes of the cat. The sensor is light/shadow/motion sensitive and she will say one of following three sayings with each activation of the sensor. "I know my little precious. I don't like the look of this one either. Not everyone can be as cute and cuddly as you or I! Ah-ha-ha-ha-ha! ; Little tabby - I am so hungry! I could go for some children stew - would you like that? Oh, we are in luck! It looks like the main course just arrived! ; I don't suggest you pet my cat - unless you're looking to get a finger bitten off! My little tabby is very fond of human flesh!". Assembly required.